China is gearing up to perform its first-ever manned space docking Monday (June 18), a feat that would put it in the company of history's two greatest spacefaring nations, the United States and Russia. 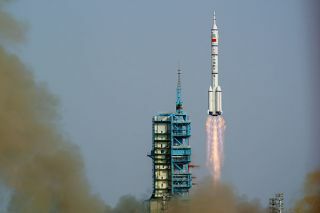 China's Shenzhou 9 space capsule — which launched Saturday (June 16) carrying three astronauts, including the country's first female spaceflyer — is expected to link up with the unmanned Tiangong 1 space lab around 3 p.m. Monday Beijing time (3 a.m. EDT; 0700 GMT), according to Chinese media reports. To date, the only two countries to pull off a manned orbital docking are the United States and the Soviet Union/Russia, which first did so in 1966 and 1969, respectively. Shenzhou 9 will dock with Tiangong 1 twice, with the first hookup being automated. At some point, the two spacecraft will separate, and the three taikonauts, as China's astronauts are known, will perform the second docking manually. Forty-six-year-old Jing Haipeng leads the taikonaut crew, which also includes Liu Wang, 42, and 33-year-old Liu Yang, China's first female astronaut. All are members of the Communist Party of China and former pilots with the People's Liberation Army; Jing flew on China's last manned spaceflight, which took place in 2008. Two of the taikonauts will live aboard Tiangong 1 during the 13-day mission, while one will stay aboard Shenzhou 9 at all times in case of emergency, Chinese officials have said. While Shenzhou 9's flight is China's first attempt at a crewed space docking, the nation has successfully linked up two robotic spacecraft in orbit. In November, the unmanned Shenzhou 8 craft docked twice with Tiangong 1 before returning safely to Earth. Shenzhou 9's mission is China's fourth manned spaceflight, following taikonaut launches in 2003, 2005 and 2008. Another manned mission to Tiangong 1 — which launched to orbit in September 2011 — could come later this year, Chinese officials have said.